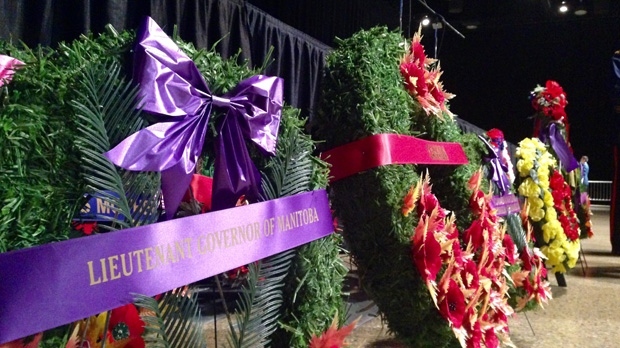 Wreaths are shown at the RBC Convention Centre on Nov. 11, 2015 for the Remembrance Day service in Winnipeg. Remembrance Day is coming up this Sunday and there’s a number of services Manitobans can attend around the province. - The Archives of Manitoba is holding an open house, which will display original records related to the experience of Manitobans during the First World War, on Friday and Saturday from noon to 4 p.m.
- The Canadian Fallen Heroes Foundation has a display of memorial prints at Polo Park until Sunday. - The Royal Canadian Air Force’s band will be hosting a concert called “For Valour: A Musical Commemoration of the End of the First World War” on Saturday at 7:30 p.m. at the Westminster United Church in Winnipeg. - The Royal Winnipeg Rifles Regiment Remembrance Day parade is on Sunday at 10 a.m. at the memorial to their 44th battalion at Vimy Ridge Memorial Park. - Ellin Bessner will be doing a presentation on her book “Double Threat: Canadian Jews, The Military and World War II” on Sunday at the Asper Jewish Community Campus. - There will be a Remembrance Day service at the RBC Convention Centre on Sunday beginning at 10:40 a.m. You can watch on CTV Winnipeg or stream it online on the CTV News Winnipeg website. - Camp Morton Provincial Park will be holding an outdoor service for Remembrance Day from 10:45 a.m. to 11:15 a.m.
- The Royal Canadian Legion will be holding several services at its various branches. 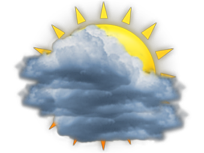 To find out information about the times and locations visit their website. - There will be a Remembrance Day memorial service at 11:30 a.m., followed by a presentation at 12:15 p.m. at the Holy Trinity Ukrainian Orthodox Metropolitan Cathedral in Winnipeg. - The exhibit “As the War Ends: Manitoba’s Newspapers Recount the Last Days” is running at the Manitoba Legislative Library until Tuesday.